Rikon Power Tools 82-100 Wet Sharpener Kit44; 8 in. Has anyone used this tool to sharpen gouges and with what results? Would like to hear both pros & cons. One of my questions would be whether it comes with jigs and if not, are the Tormek jigs compatible. It appears to me if you read the description of each the Tormek at twice the price still doesn't include jigs. That is at least the way I read it. I think if you check with a retailer like woodcraft, the tormeks do come with a few of the jigs. Mine did. So what do you think about the Tormeks sharpening abilities for gouges? Was it worth the money? With the jigs, you received can you sharpen the gouges? Anything else I should know about it would be nice. Tormek will sharpen your gouges with a hollow grind. If you can work with that, great. I've used a tormek for over 20 years and I find it perfect for my needs and the way I work. My gouges are sharp. As a current Rockler employee I can say that the Rikon is a waste of money. There is a giant seam on the stropping wheel, and the whole thing feels like it's going to collapse at any moment. We have a crap ton of them at my work and can't give them away. Well with that said I guess I should maybe look for a used Tormek. A new one is sure pricey then there are the attachments. Thanks for all the responses and opinions. I bought my Tormek 2000 from a wannabe bowl maker. Probably only used once then sat in his garage for 7 years. Quick search showed one in your area. A little patience and one will turn up that you like for the price/quality you're looking for. Thank you for your candor, Nick. Are any of the horizontal power sharpeners worth the problem? well, this is what I use... love it! Dwight... is this what you call a horizontal sharpener? If so, what problem do you anticipate? 2. Sanding discs rapidly overheat tools and are messy to change. Magnetic diamond disc alternatives (and cloth disc for polishing) actually work decently and run very cool but pricey and diamonds wear too quickly for the price. 3. Bar which allows Tormek jigs works but also very wobbly. 4. Best luck I've had is with the flat platform that mounts next to the turntable and then using it in conjunction with my Veritas rolling jigs. But the plane of the platform needs to be parallel with turntable and the level adjustment is just weird, it's not positive or repeatable at all. By the time you've incrementally bought all the attachments trying to get it working right, you realize you could have just bought a better system in the first place. None really, I just wondered if any of them work well enough to justify the price. Yes it is pricey, but for me it works easily and reliably. The turn table is dead flat, so no wobbles. I use my finger near to the grinding point and apply light pressure ... that way as soon as I feel any heat developing, i can lift the chisel off and water cool. The nice part is that there are 2 thicknesses of plates, The plate for shaping and grinding grits is thicker than the ones for sharpening and polishing ... that way when you switch from a coarse grit to fine grit you automatically create the fine edge bevel. Each plate can have grit on both sides so it is easy to flip to the next grit. I can reshape to finish polish a chisel in less than 5 minutes. Touch up sharpening is a mere minute or two. Pricey, yes, but the quality and ease of use is worth it... especially considering that time is money! doing gouges is essentially freehand, but I do use the guide bar as a reference point. and by the way... the current price is $389 Canadian, converted to US dollars... that is about $290 US. PS.. I have no connection to Lee Valley except that I am a customer! Unless I'm missing something, above link is US site and cost is USD $389. Your first link was Maple Leaf in upper right and cost Canadian $479. I have the Tormek toy and there is an overlap in the leather on the stropping wheel. It may not be everyone's luck, but that's what I got. Mmm - is this the forum that extols the virtues of fettling a handplane flat and square for best performance? I looked at the picture of the Rikon and my first thoughts were "Well, that cast base is an improvement on the folded sheet steel base of the Tormek." On seams in the stropping leather - "So what! On the Tormek I had to spent time dressing the leather wheel to get it to run "flip" free". It's almost an article of faith with me that nothing will not become better following a strip, clean, judicious stoning here and there and a careful reassembly. I mislaid my Mitutoyo venier caliper and nipped down to the local hardware store and bought a Chinese replacement - it took ~2 hours to get both the internal and external jaws to shut light-tight and on zero. A cheap pneumatic die grinder gained a good few extra thousands of rpm after some TLC. Do not expect perfection from anyone but yourself. That way there's only 1 person to be held responsible and he's always close to hand for a dressing down. I have been using the Worksharp 3000 for over a year now with none of the problems previously described here. The Tormek can get a little messier than I like, when using the water bath. But the water bath does a great job of preventing overheating. Yup - if Brian hadn't run off to California, I might just have made a pattern and moulded up a fibreglass bath with a flange to intercept that pesky drip. I'd been thinking about doing it for a couple of years. What is your hourly rate? 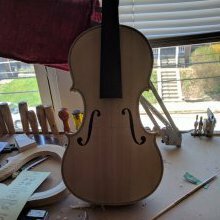 For most violin makers/ repairers, ~2 hours is quite a bit of money. It's been said here before, but time is money, and for some it is worth extra of the latter to save on the former.